This antique commode is a truly remarkable piece, and was crafted after a very famous and important piece by the 18th Century cabinetmaker Charles Cressent. 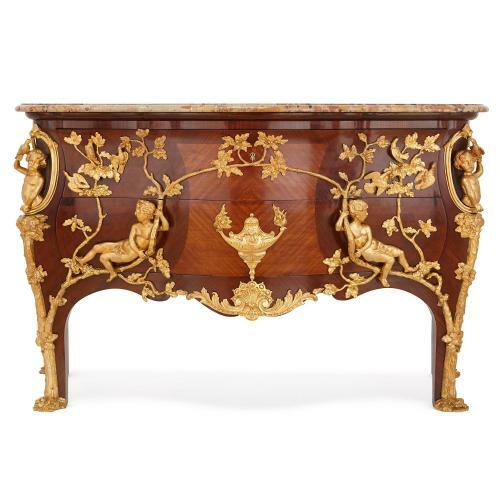 This resplendent commode, or chest of drawers, is a masterpiece of design, materials and conception. 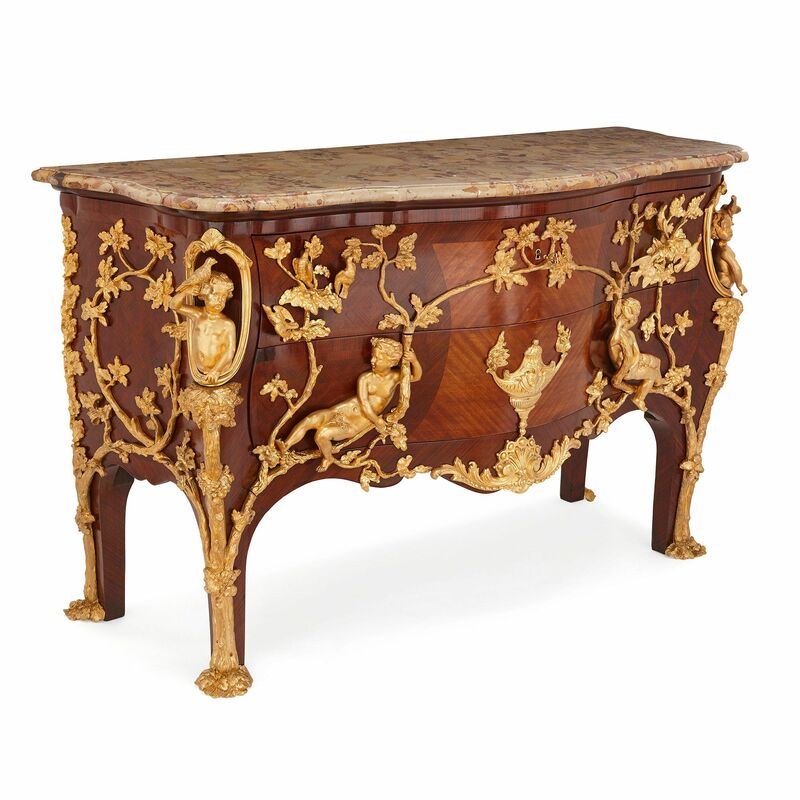 It was made after a commode by Charles Cressent (French, 1685-1768) which was commissioned in the 1730's by Madame Julliot. After exchanging hands several times, it can now be seen the Rothschild Collection at Waddesdon Manor in Buckinghamshire, England, where it is one of the jewels of the collection. The commode features a broad, bombé form and is topped with a sheet of veined, pink, serpentine marble. 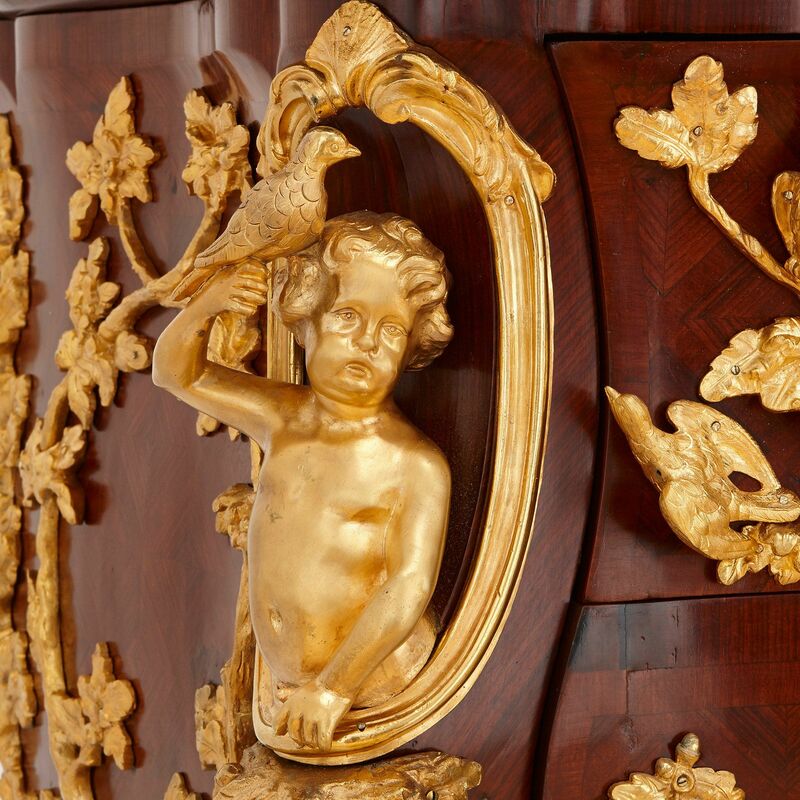 The body of the commode is crafted from rich walnut, and is mounted extensively in ormolu all over with entwining oak branches festooned with leaves and doves. 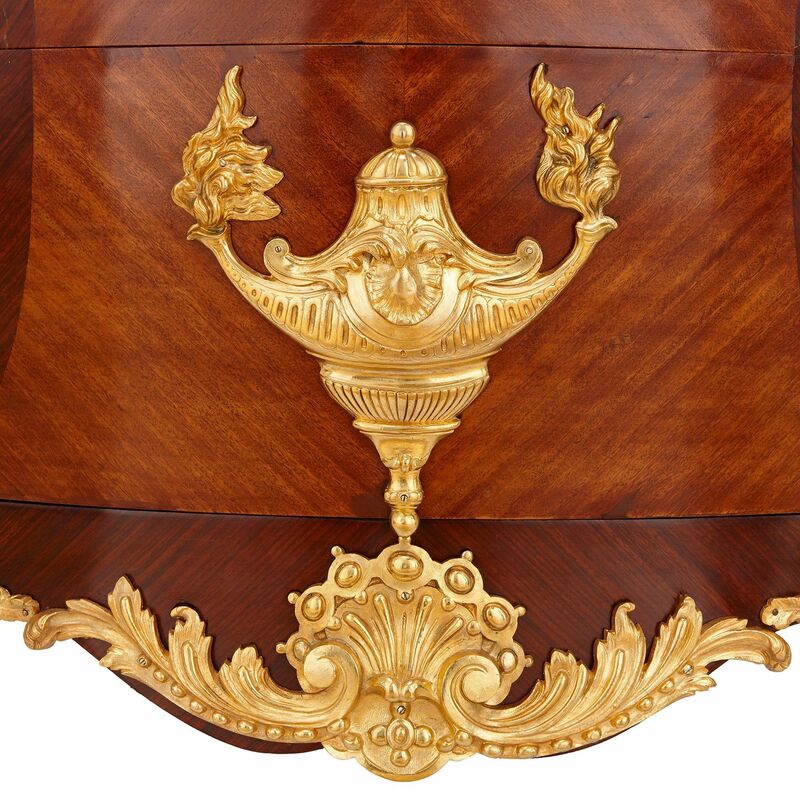 The front of the commode, which is inlaid with a fine, wooden veneered pattern, features additional ormolu detailing with a central flaming urn above a shell cartouche. 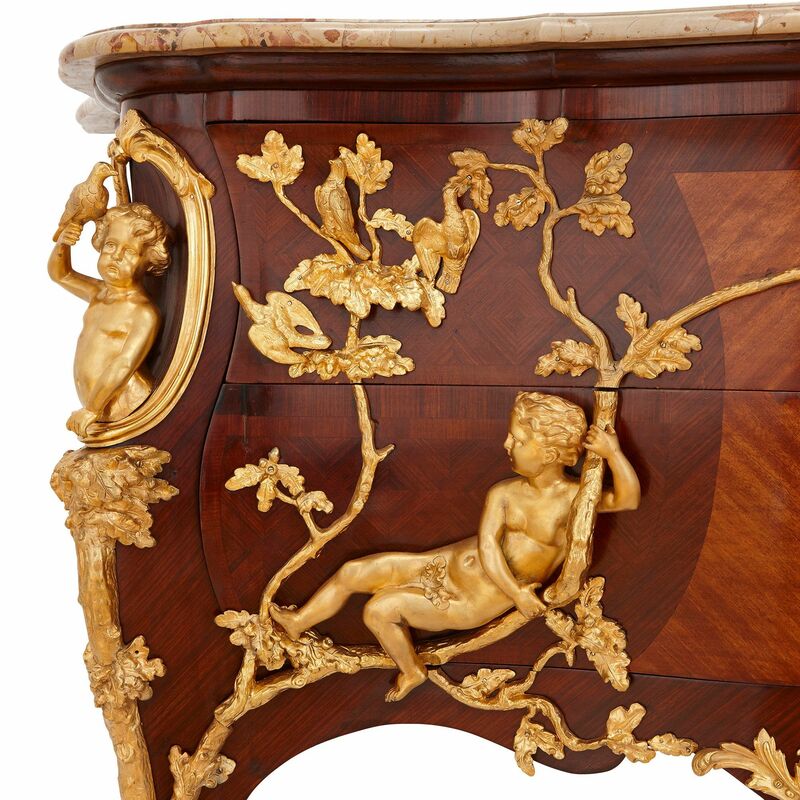 The urn is flanked by two putti who recline amongst the oak branches, and the front two corners of the commode are further mounted in ormolu with cherubs holding doves, which lead downwards to oak trunks mounted to the elegantly curved cabriole legs. Whilst stunningly beautiful, the ormolu mounts almost disguise the additional practicality this commode offers. The front is set with two large drawers; the uppermost of which can be opened and locked with a key. 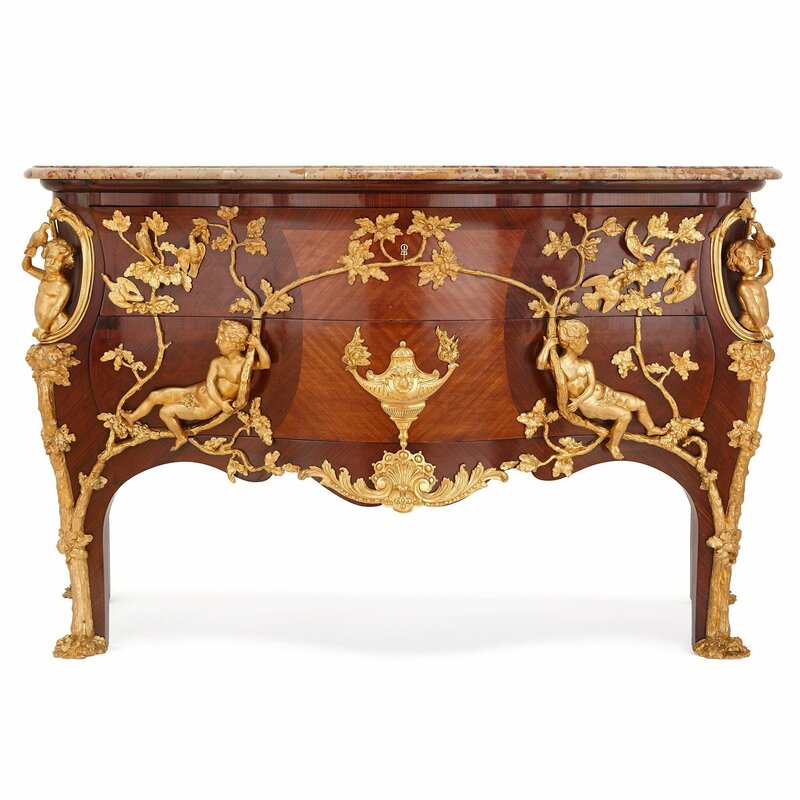 The original commode by Cressent, on which this piece is based, was commissioned in the first half of the 18th century by Madame Julliot. 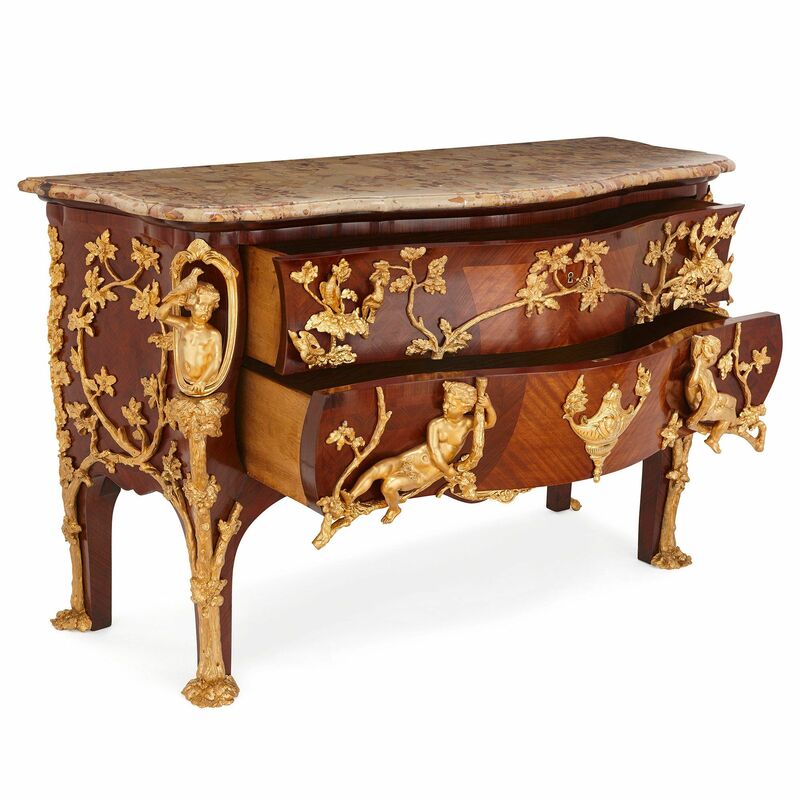 Later in the collection of the Dukes of Hamilton, the commode was sold at the Christie's Hamilton Palace sale (lot 1806) in 1882 for 6,417 pounds, 10s. It is forms part of The Rothschild Collection at Waddesdon Manor.